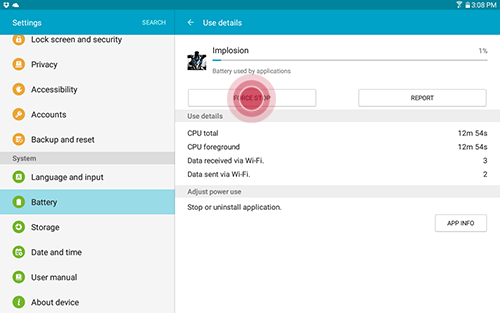 Galaxy Tab E: How can I Monitor Battery Usage on my Samsung Galaxy Tab E? Your device has built-in battery management that lets you view and monitor which applications and features use the most battery power. Important: Use only Samsung-approved chargers and cables. Unapproved chargers or cables can cause the battery to explode or damage the device. 1. From the Home screen, touch Apps > Settings > Battery . 2. The Battery screen displays the percentage of battery power remaining and how long you might expect that power to last. 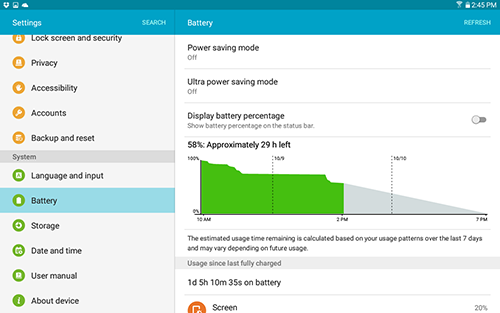 It also displays the processes that have been using the battery power since the last Full charge and the percent used by each. Note: Screen display may vary by user usage. 3. Scroll to and touch a process or application to view its Use details. 4. 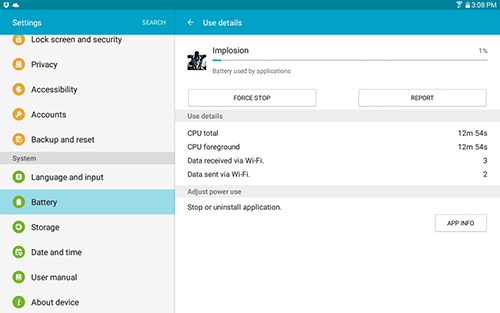 Touch FORCE STOP to end the application. • Verify that you are using the supplied Samsung USB/charging cable and not third-party accessories. • Make sure a battery or charging indicator appears on the device's display when the USB/charging cable is plugged in. • Disconnect the device from the USB/charging cable when the battery is fully charged.